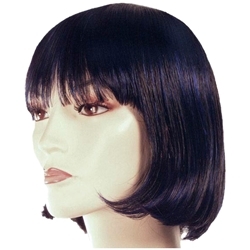 China length style, unisex wig. The wig features an elastic band for a comfortable and secure fit to almost any head size and is available in a wide color of natural and clown colors. Good for everything from oriental styles to medieval (Prince Valiant), the Dulockians in Shrek, as well as 1920's through the present.